Joseph M. Ahearn updated profile. View. Joseph M. Ahearn posted a message. 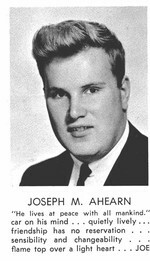 Joseph M. Ahearn has a birthday today. New comment added. Joseph M. Ahearn has a birthday today. Joseph M. Ahearn added a comment on Profile. Joseph M. Ahearn has left an In Memory comment for Ric Canning. Grew up with Ric and unfortunately grew apart. I remember the time we were playing catch in my yard and he threw a hard/high fastball that I couldn’t catch but the garage window caught instead. Tried to hook up with him in Viet Nam but his unit got redeployed before I got back to base camp. I visit “The Wall” and pay my respects to him and Jimmy Scuitier often. RIP both of you guys and all the names on the wall !